Are you a fan of pork? I am and, today, I'm sharing this wonderful recipe for Pork Chops Romano in Lemon-Butter Sauce. It's a quick and easy center cut pork chop recipe, perfect for busy weeknights! I'm happy to be partnering with Ohio Pork Council for this post because I'm a big fan of Ohio pork. I serve it to my family at least once a week. I love it because it's a great, lean protein with lots of flavor and is one of the most versatile proteins I cook with. 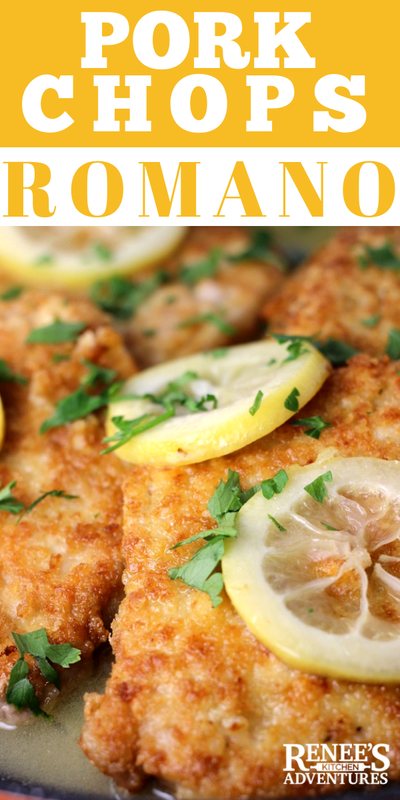 One of my favorite healthy pork chop recipes is Pork Chops Romano in Lemon-Butter Sauce. Made from boneless, pork loin chops pounded thin, it's a quick and easy meal for any day of the week. 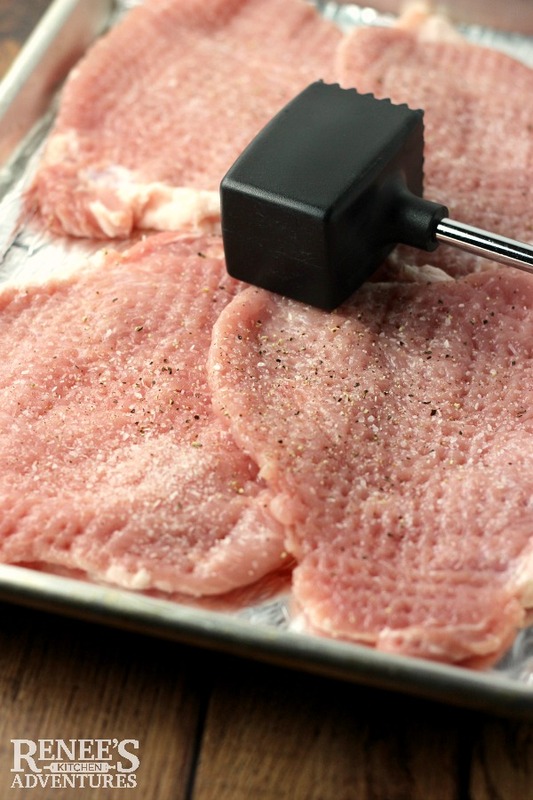 If you have a full-service butcher available to you, you can ask for the pork chops to be run through the tenderizer, eliminating the need to pound them thin. If you don't, no worries, your meat mallet will help make quick work of it. Pounding the pork chops thin helps move along the cooking process and makes the chops even more tender than they already are. If you love pork chop recipes, you've come to the right place. While you're here, you might want to check out my easy recipe for Mushroom Pork Chops or my Breaded Oven Baked Pork Chops. Both of these healthy pork chop recipes are quick, easy, and good for you! The lemon butter pan sauce compliments these pork chops so well and is very easy to make. The recipe calls for wine, but you can use all chicken stock/broth if you prefer. As far as I'm concerned, lemon and pork are flavors that are meant to be enjoyed together! I served these Pork Chops Romano in Lemon-Butter Sauce with some pasta and steam green beans for a complete meal for a quick weeknight meal for my family that we all enjoyed! Are you a fan of pork? 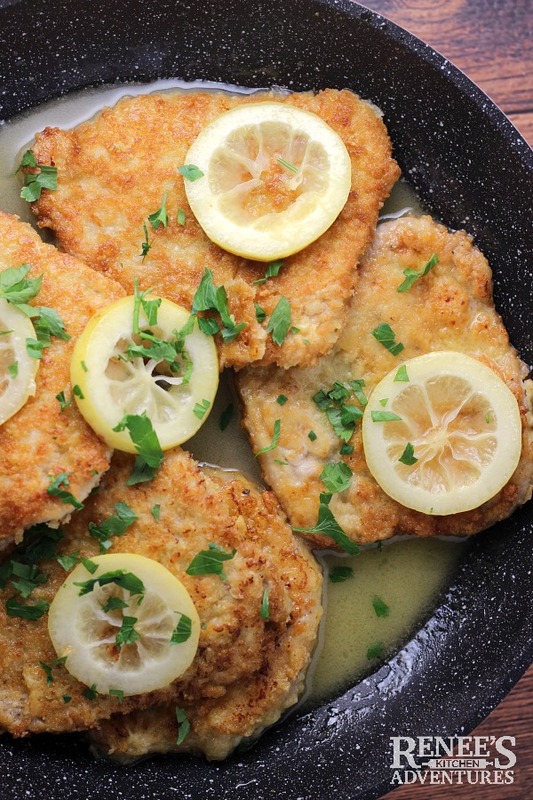 What would you serve with these Pork Chops Romano in Lemon-Butter Sauce? 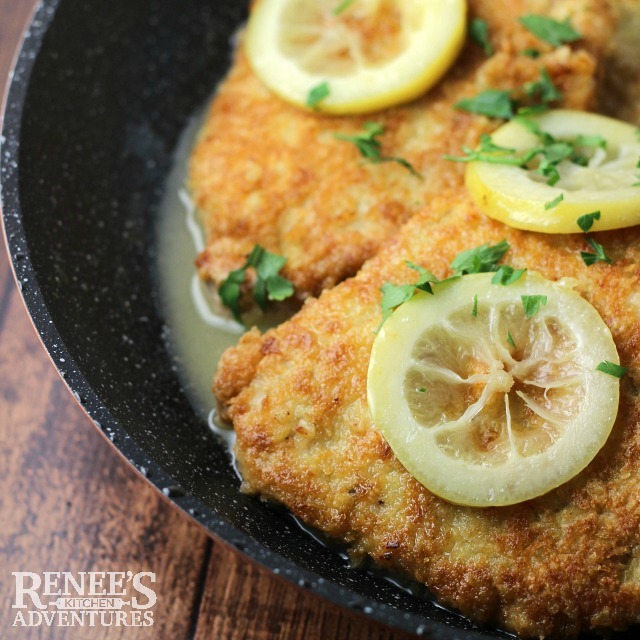 Tender center cut boneless pork loin chops are breaded with Panko and Romano cheese and fried crisp, then coated in a lovely lemon butter pan sauce for an easy weeknight dinner! Season flattened pork chops with salt and pepper. Set aside. Prepare a dredging station. Put the flour in a shallow dish. Put the eggs and water in another shallow dish. In a third shallow dish, combine the Panko bread crumbs and Romano cheese. Once all chops are browned on both sides, wipe pan with paper towel and return to stove. Add wine to pan and bring to boil over med heat. Add in lemon slices and let mixture reduce by half. Once reduced by half, turn heat down to low and add chicken stock or broth. Heat until warmed through. Swirl in room temperature butter. Once butter is melted and incorporated into sauce, Add chops back in and coat with sauce and continue to cook to internal temp of 145 degrees F, or pour sauce over chops if already 145 degrees F.
Sprinkle with chopped parsley before serving, if desired. 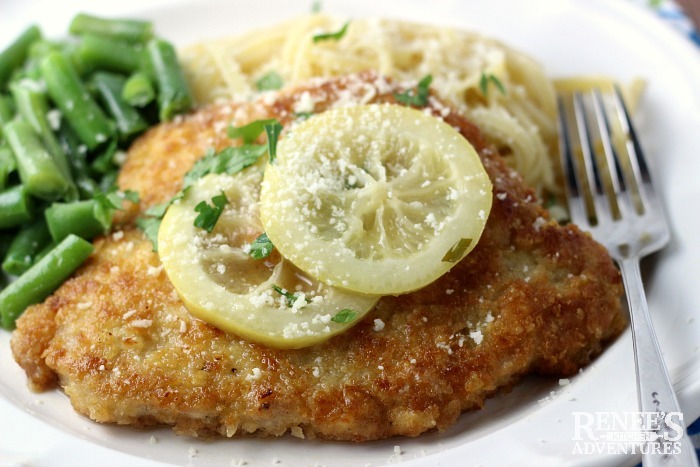 Pin Pork Chops Romano in Lemon Butter Sauce! Definitely a pork fan here! My husband is going to love this recipe. It'll remind him of the schnitzel we ate while in Germany, but this will be tastier with the lemon sauce! Great looking pork chop recipe. Thanks for supporting Ohio Pork! Definitely a keeper!!! We so enjoyed the flavor of the pork with lemon sauce!! Thank you for your review! I think the pork and lemon do work so well together too! If you are making more than 4 pork cutlets, do you double or triple all the other ingredients according to how many chops you make? Anyone know the answer. I am using pork cutlets, not chops. Hi Linda! You should be able to use pork cutlets and chops interchangeably without needing to adjust the ingredients, since the chops get pounded flat anyway. You may have enough other ingredients to coat 6 chops/cutlets as written IF they aren't too big, otherwise you'll probably need to adjust the amounts of coating and sauce ingredients. Hope this helps! Thanks! This recipe is beyond 5 stars!! Absolutely delicious! Thank you. So very glad you enjoyed it! Thank you for coming back and leaving a review!